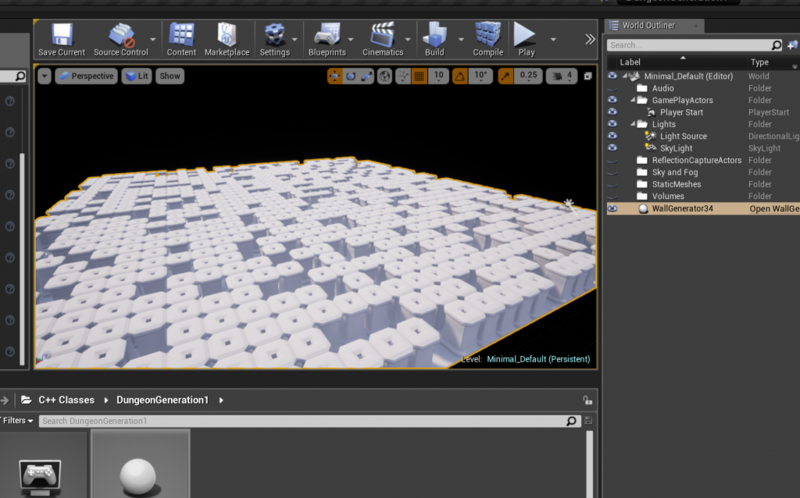 Unreal Engine Technical Writer Ian Shadden created a very complex blueprint code to generate a random dungeon (it does a lot more than just generate a dungeon!) This post just details my first time experiences working out how to create a simple C++ class to generate something similar. I’ll start by aiming to replicate the first 16 minutes of this video. This bit wasn’t too complicated in the blueprint! If I can do that then I think I will have gained a bit more understanding of how UE4 class libraries plug together. Others have done similar but nothing like doing it yourself to understand! The list above took me a few hours to work out! Luckily there are some great resources out there for UE4. Where to start? I know that the thing I want to create is an actor. Something I can place “in the world” and it can do things. I shall create an actor class that will then generate instance static meshes. This is a common technique from other engines (where you basically just change a transform and render another copy of the same mesh). I’ve also copied the “wall_pillar” and “floor” content from the blueprint tutorial – just so I can get it working quickly. The blueprint example gives plenty of hints as to the way forward. I need to override the “OnConstruction” function so that I can have behaviour in the editor and at “game” time. First problem – what is the signature of “OnConstruction”? I just looked in the base class header (Actor.h). You can right click a #include and visual studio context menu includes “Open Document”. The UE4 engine has an UInstancedStaticMeshComponent (components are things that can be added to actors). The UInstancedStaticMeshComponent has a UStaticMesh and a set of Instances (basically a big list of transforms). In my “OnConstruction”, I iterate over two indices (for the XY plane directions), roll a random number and create an instance of a wall or a floor. We need to physically load a mesh and bind it. The trickiest bit was working out the folder structure to load the meshes. Once the mesh is loaded we can create the UInstancedStaticMeshComponent. I created two of these – one to hold floors and one to hold walls. This entry was posted in Dungeon, Programming, UE4 and tagged Random, ue4 on December 3, 2017 by Tomlin Games.